Heat oven to 350°F. Grease 15x10x1-inch pan with shortening or cooking spray. Line with foil, extending foil over short sides of pan; grease foil. In large bowl, beat cake mix, flour, water and eggs with electric mixer on low speed until moistened, scraping bowl occasionally. Beat on high speed 2 minutes, scraping bowl occasionally. Spread batter evenly in pan. Bake 18 to 20 minutes or until cake springs back when touched lightly in center. Remove cake from pan by lifting foil; place on wire rack. Cool completely, about 15 minutes. Meanwhile, in small bowl, mix pie filling and 1/2 teaspoon of the almond extract. Cut cooled cake in half crosswise to make 2 (10x7-inch) layers; remove foil. Place 1 cake layer on serving platter or tray; spread pie filling mixture over top. Top with remaining cake layer. Stir remaining 1/4 teaspoon almond extract into whipped topping. Spread mixture over sides and top of cake. Serve immediately, or loosely cover and refrigerate until serving time. 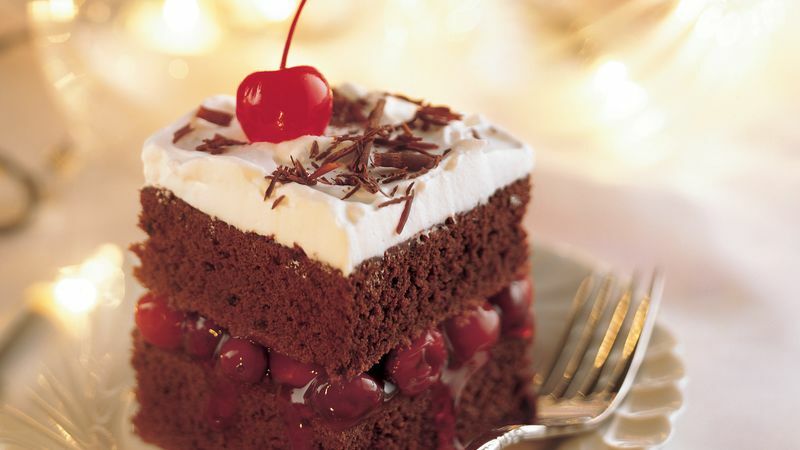 If desired, garnish each serving with maraschino or candied cherry and chocolate curls. Store in refrigerator.